War Memorials list the names of men (sometimes boys) who died in the First World War, and the focus often falls on the trench warfare of the Western Front, but what was the experience of women during this time? 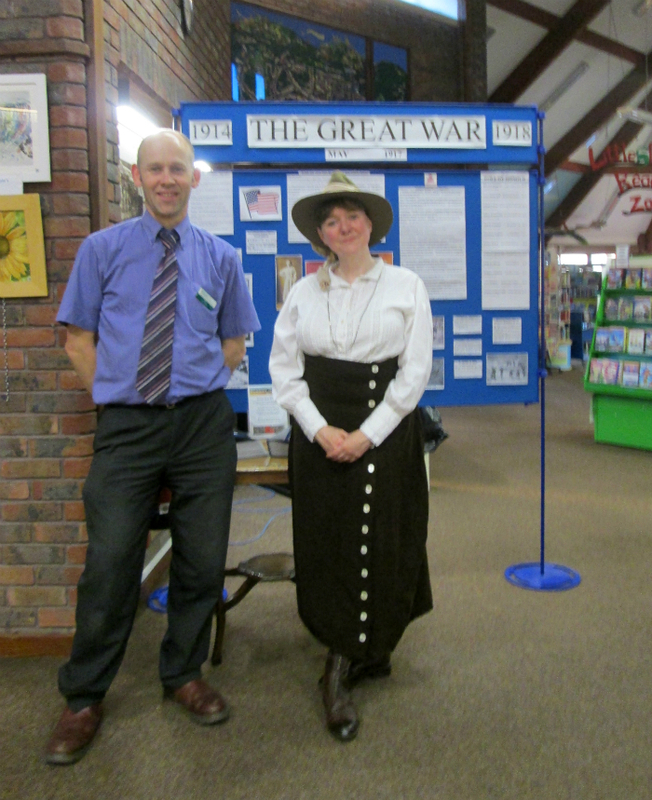 A talk given to an attentive audience at Warminster Library and Museum on Friday 26th May explored the many different roles taken on by Women during the First World War. The talk by Emma Shelley was one of a series of events held across the county as part of the “Wiltshire at War” project funded by the Heritage Lottery Fund and Wiltshire Council. Emma, who delivered the talk in Edwardian costume, is a social historian fascinated by this period and the many extraordinary stories of British women who contributed to the war not just at home by stepping into jobs vacated by men called up to fight, but also operating at the frontline in roles such as motorised ambulance drivers and combat nurses for the First Aid Nursing Yeomanry Corp (known as the FANYs). The talk, illustrated by rare contemporary photographs showed the huge variety of work taken on by women during 1914-18 in roles which until that time had been exclusively male including public transport, heavy industry, munitions factories, agriculture, education, and the medical profession. Although these roles were taken back by men after the war, Emma argued that this combined with pressure from the Women’s Suffrage movement (who abandoned their often violent pre-war protest actions) ensured that women gained the vote at the end of the war in 1918, and made a huge contribution to the fight for equality. On the home front many issues that are now usually associated with the Second World War in fact first appeared during WWI : German U-Boat attacks on shipping led to rationing, especially on bread with people being encouraged to eat potatoes instead. ‘The Win-the-War Cookery Book’ carried this message: ‘Women of Britain … Our soldiers are beating the Germans on land. Our sailors are beating them on the sea. You can beat them in the larder and the kitchen.’ The Women’s Land Army was formed to help grow more food and make Britain less dependent on importing food from overseas. From 1915 the first air-raids on British soil occurred when German Zeppelin airships bombed towns and cities such as Dover, Hull and London. However, the audience were also fascinated to hear of some of the less well known stories about women who willingly put themselves in danger as frontline nurses, often against the wishes of military authority. For example Mairie Chisholm and Elsie Knocker met through a shared love of motorbikes, a pursuit which already marked them out as unusual for the time, but when war broke out they made their way to Flanders where they ran an advanced dressing station treating wounded frontline soldiers whilst seconded to the Belgian Army as the British Army would not sanction their actions. (Their story is told in the book “Elsie and Mairie go to War” by Diane Atkinson available in the library). Speaking after the event Emma Shelley said that she had greatly enjoyed the evening and was very appreciative of the perceptive questions asked by the audience in Warminster. This was last of the talks she has been giving in Wiltshire Libraries but she will be out and about during the Summer at various festivals with “Agatha” a re-constructed WWI ambulance she has built along with her partner who is also a First World War historian and re-enactor. Peter Waterman, Warminster Library Manager, commented “I am very grateful to Wiltshire at War for putting on this free event in Warminster and to Emma for such an interesting examination of events and people that have in the past been unfairly overlooked.” He went on to say that those interested in the history of the First World War should continue to look out for the changing display board that the Warminster Museum and History Society are exhibiting in the Library and Museum as part of the ‘Great War Project’ honouring all local people from Warminster and the surrounding villages who died in the First World War. The project consists of two parts: a display board that is changed every month to show the events that happened 100 years earlier, and books of Remembrance detailing each person who died from the Warminster area.